Are you actually looking for women's brown tees? Well, we hope you are because the reality is that you have found our page on the topic. Now you can research the topic until your hearts content. 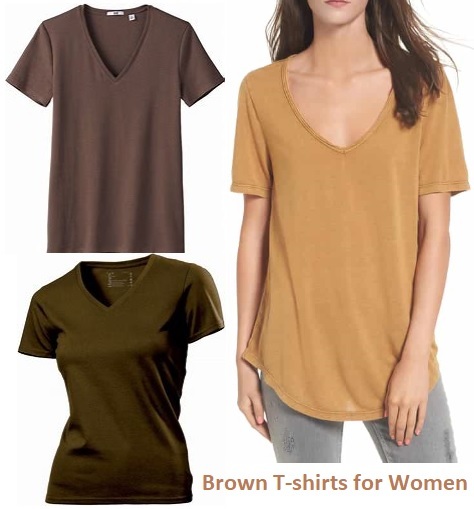 In this women's clothing section of the Apparel Search directory, you will find all sorts of interesting information regarding brown t-shirts for women. Welcome to the worlds greatest guide to ladies brown color t-shirts. The t-shirt is one of the most popular clothing items. At least one can be found in the majority of the populations wardrobe. A t-shirt is a casual top, generally made of cotton or cotton blend and having the shape of a T when spread out flat. This type of top can be either long sleeve or short sleeve, but it is most popularly found as a short sleeve garment. T-shirts are generally made of a light, inexpensive fabric and are easy to clean. They come in a wide variety of solid colors include a brown option. Actually, you can find many different shades of brown. In addition to solid dyed color, you can find a wide assortment of t-shirts that have brown color print designs. Popular necklines for t-shirts include crew neck and V-neck. A V-neck T-shirt has a V-shaped neckline, as opposed to the round neckline of the more common crew neck shirt (also called a U-neck). V-necks were introduced so that the neckline of the shirt does not show when worn beneath an outer shirt, as would that of a crew neck shirt. The deeper the "V" the more potential cleavage could be exposed. Women's brown tees are popular for many reasons. Brown is a composite color. In the CMYK color model used in printing or painting, brown is made by combining red, black, and yellow, or red, yellow, and blue. In the RGB color model used to project colors onto television screens and computer monitors, brown is made by combining red and green, in specific proportions. The brown color is seen widely in human hair color, eye color and skin pigmentation. Brown is the color of lovely dark wood or rich soil. This color comes in a wide variety of shades. Apparel Search is a leading guide to fashion, style, clothing, glam and all things relevant to apparel. We hope that you find this women's brown t-shirt page to be helpful. You can also check out the women's t-shirt section. If you want to be even more stylish, you should wear your favorite brown t-shirt today. What is your favorite type of t-shirt? Do you have a favorite style and color? You may find the following sections of our site to be of interest. Thank you for using the Apparel Search website. We certainly hope that you have found this page to be helpful. If you can think of any ways for us to improve the page, please do not hesitate to let us know you opinions.